Don’t feel blue! Blue is a great color. Blue foods are high in antioxidants and are delicious too. Blueberries – Blueberries are a super food with a high concentration of antioxidants. Blueberries are said to promote healthy nerve communication, protect DNA from damage, prevent or improve diabetes. Blueberries are “high in fiber, vitamin C, folate, iron, manganese and potassium as well as B-complex vitamins, vitamin E and the essential fatty acid linolenic acid”. 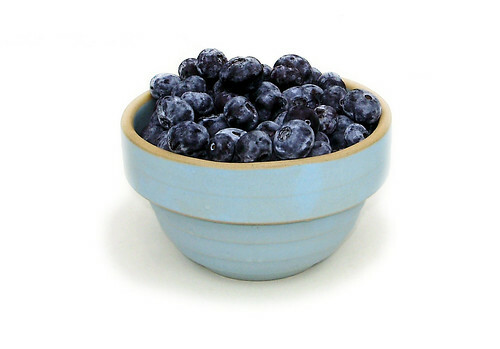 Eat blueberries on their own as a snack, in baked goods, fruit salads, or pancakes. Purple Kale – If you read the Green With Envy post last week about healthy green foods, you’ll know that I raved about the health of kale. Guess what??? There’s purple kale too. So ditto for the super food. Prepare purple kale in salads, soups, or saute with olive oil and garlic. Purple Potatoes – Like blueberries purple potatoes are high in the antioxidant anthocyanins. “This flavonoid has been shown in studies to possess anti-cancer and heart-protective effects, as well as benefits such as boosting the immune system and protecting against age-related memory loss.” Purple potatoes can be roasted, used in soups, or potato salad. Eggplant – Eggplants are high in dietary fiber, potassium, and manganese. Eggplant is brain food because it contains nasunin. “Nasunin is a potent antioxidant and free radical scavenger that has been shown to protect cell membranes from damage.” Eggplants also contribute to good cardiovascular health. There are more ways to enjoy eggplant than Parmesan. Eggplants can be roasted, stuffed, used in spreads, ratatouille, and in stir fry. Acai Berry – Acai Berries and juices have been increasingly popular. These berries include the same anthocyanins as other purple foods. Some weight loss fads claim that the acai will help increase weight loss. However, according to WebMD, there are not enough studies to verify these claims. Either way, the acai berry provides benefits like the blueberries. What are your favorite blue or purple foods?